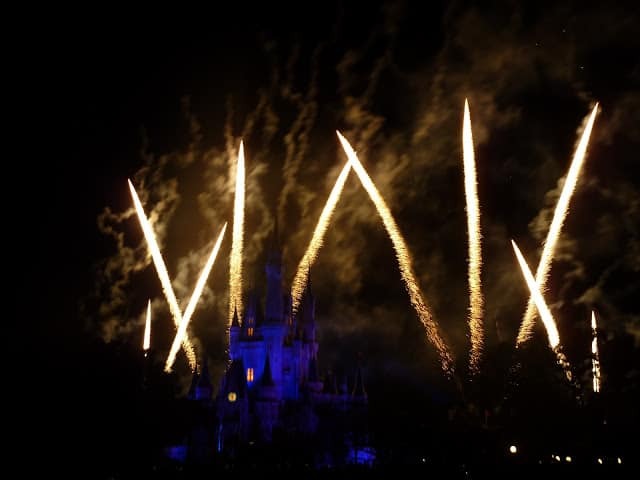 No Walt Disney World vacation is complete without seeing the “Wishes Nighttime Spectacular” at the Magic Kingdom. 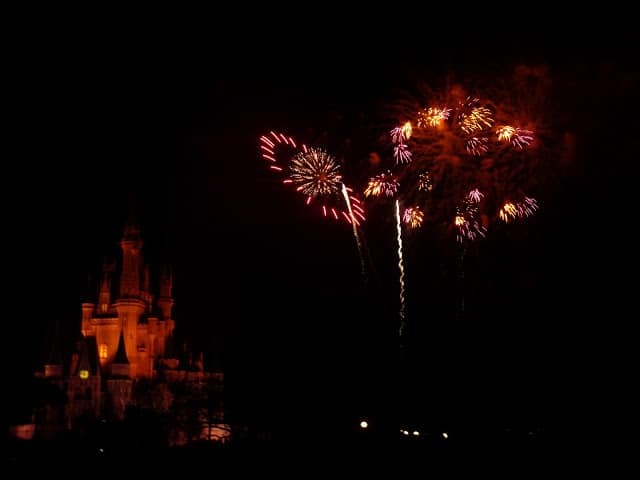 It’s an amazing fireworks display above Cinderella Castle set to the music of Disney. It can’t get any more magical then that, can it? 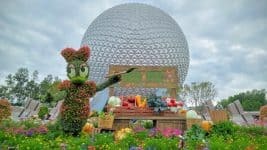 Well, what if I told you that there was a way to reserve VIP seating for “Wishes” where you could enjoy the show while feasting upon an incredible dessert buffet? At the Tomorrowland Terrace Dessert Party, the nighttime spectacular becomes a treat not just your eyes and ears, but for your taste buds as well! We first heard of this opportunity for adding a little extra magic to our trip 3 years ago. The more we read about it, the more we knew it was something we had to experience for ourselves. The problem was, they didn’t offer the dessert party every night, and though we kept calling every week, no one could tell us if there was one scheduled during our trip. Alas, when it came time to depart for Disney, we did so without a desserty party reservation. We were disappointed, but that didn’t get us down. 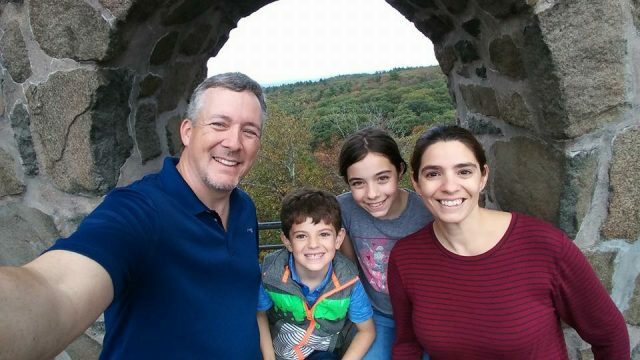 We were still enjoying a magical vacation. On our Magic Kingdom day, when we were passing by the Tomorrowland Terrace where they hold the dessert party, we noticed they were setting up for some kind of event. I asked one of the Cast Members and she told me it was indeed the dessert party, but it was only for people with a reservation. This would have been a moment made for a Sitcom years before, but not in the age of cell phones. I whipped mine out and dialed the number I knew so well to get someone from Disney Dining. I asked if they had any availability for 3 that night for the Wishes Dessert Party and was told that there was no such event that night. huh? This is a lesson in Disney planning: Cast Members are just people. 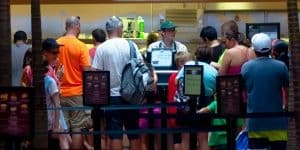 They are capable of mistakes, and given the immense scope of Walt Disney World, it’s hard to expect any one single Cast Member to know absolutely everything there is to know. I explained that it was a special event and that I was there at that very moment, inside the Magic Kingdom, looking at the venue and I could assure her it was actually taking place that night. After holding for a few minutes, the Cast Member came back on the line to tell me that she had found it, and that yes, there was availability for 3! This is a prepaid event, so I supplied her with our payment information over the phone and she gave me a confirmation number. Armed with a reservation, we approached the entrance only to find that they were using a print-out of the reservation list. But the Cast Members called for a manager, who was kind enough to go chase down our last-minute reservation information. The party opens an hour before the fireworks begin. On this night, it was 9pm ahead of the 10pm showing of Wishes. We were escorted to our table, and told simply to help ourselves to the buffet and enjoy. The area for the party encompassed the lowest tier of the terraced seating area, covered to protect from any possible rain, with an open air view of the Castle and the sky around it. Our daughter, Isabella, enjoying her dessert. Cinderella Castle in the background. Beautiful! There was a beverage station, and a 10 to 15 foot buffet of desserts. Just one look at the decadent display was enough to know that our plates were too small. There were cookies and brownies, chocolate mousse and creme brulee, cheesecake and pies, chocolate covered strawberries, and even ice cream. Simply put, it was awesome! A sampling of dessert items. Don’t they look delicious? 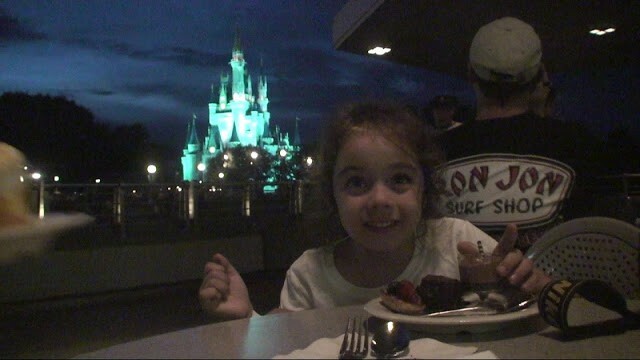 We ate our desserts, going back for at least seconds, and admired the view of Cinderella’s Castle. From our seats, we had a partial view of the evening parade as it made its way up Main Street to the castle. Then, it was time for “Wishes” to begin. The overhang blocks the sky if you stay in your seat, so we stood up and moved over to the railing, where there was plenty of room to stand and nothing in our way. The view was great! You’re a little off to the side, so the majority of the fireworks appear up and to the right of the castle, but it’s still a terrific vantage point. A little extra magic is that Tinkerbell’s flight from the castle takes her right toward you, especially if you are at the end of the terrace closest to Tomorrowland. We enjoyed it so much that last year, we booked it again for our Magic Kingdom day. It was even better this time. They’ve expanded the area they were using to accommodate more people, but it still wasn’t crowded enough to make viewing the fireworks a problem. 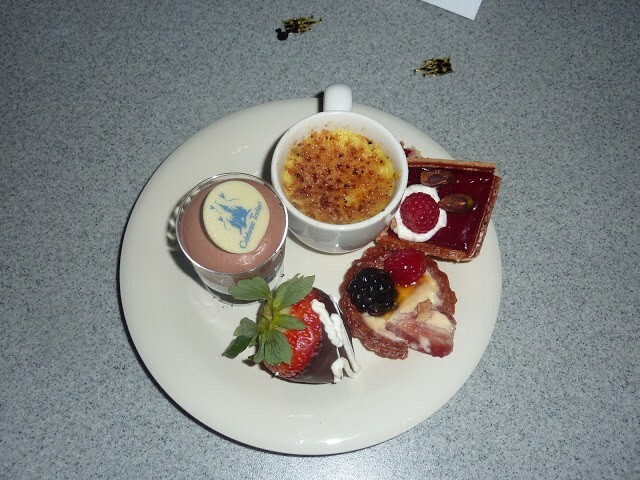 The assortment of desserts was still excellent, and overall the event seemed much more organized than that first time. If you’re looking to add a little extra magic to your Walt Disney World vacation, I highly recommend the Tomorrowland Terrace Dessert Party. It’s an excellent way for families to enjoy the fireworks with a guaranteed view and some refreshments. 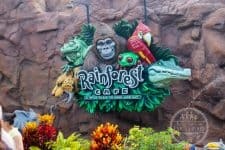 They use a wristband system to identify those with reservations (not sure if this will change with My Magic+), and having that wristband allows you to come and go. That’s necessary for using the restrooms, and it can also allow your older children to sneak out for a closer view of the parade as it goes by, and then return for the fireworks. The buffet ends with Wishes. So be sure to grab any last items you might want just before the fireworks begin, as the Cast Members will be cleaning up while everyone is enjoying the show. Prices can vary throughout the year, but expect to pay at least $25 per adult (10 & up) and at least $15 per child. During peak seasons, those prices could be closer to $30 and $20, or even more during holidays. Dining Plan credits are not accepted. The online reservation system says you can reserve a table 90 days out, but the dates don’t seem to be set that far in advance. 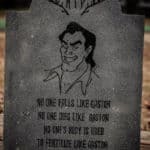 At the time of this writing, reservations only seem to be available up through April 2013, and it’s probably best to call and speak to a live Cast Member.